In order to examine whether the concept of God is coherent we examine whether the concepts of omnipotence, omniscience, perfect goodness and so on can be spelt out in a coherent and mutually consistent way. We then look at arguments for the existence of God from publicly available data - from the existence of the Universe, its conformity to scientific law, its being fine-tuned to the evolution of human beings, its being providential, the existence of human souls, publicly available evidence about historical events, and the widespread phenomena of religious experience. We examine the argument against the existence of God from pain and suffering. I introduce the probability calculus and examine - if such arguments are not deductively valid - how probable they make their conclusion. Finally we consider whether justified religious belief needs to be backed up by argument. R. Swinburne, The Existence of God (1991 edition). J.L. Mackie, The Miracle of Theism. (ed.) E. Stump and M.J. Murray, Philosophy of Religion: the big questions. (ed.) 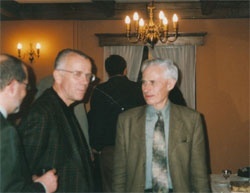 M. Peterson and Others. Philosophy of Religion: selected readings (second edition). T.V. Morris, Our Idea of God.